PIK-93 inhibitor (yellow) bound to the PI3 Kinase 110 gamma subunit . The phosphoinositol-3-kinase family is divided into four different classes: Class I, Class II, Class III, and Class IV. The classifications are based on primary structure, regulation, and in vitro lipid substrate specificity. Class I PI3Ks are responsible for the production of phosphatidylinositol 3-phosphate (PI(3)P), phosphatidylinositol (3,4)-bisphosphate (PI(3,4)P2), and phosphatidylinositol (3,4,5)-trisphosphate (PI(3,4,5)P3). The PI3K is activated by G protein-coupled receptors and tyrosine kinase receptors. Class I PI3K are heterodimeric molecules composed of a regulatory and a catalytic subunit; they are further divided between IA and IB subsets on sequence similarity. Class IA PI3K is composed of a heterodimer between a p110 catalytic subunit and a p85 regulatory subunit. There are five variants of the p85 regulatory subunit, designated p85α, p55α, p50α, p85β, and p55γ. There are also three variants of the p110 catalytic subunit designated p110α, β, or δ catalytic subunit. The first three regulatory subunits are all splice variants of the same gene (Pik3r1), the other two being expressed by other genes (Pik3r2 and Pik3r3, p85β, and p55γ, respectively). The most highly expressed regulatory subunit is p85α; all three catalytic subunits are expressed by separate genes (Pik3ca, Pik3cb, and Pik3cd for p110α, p110β, and p110δ, respectively). The first two p110 isoforms (α and β) are expressed in all cells, but p110δ is expressed primarily in leukocytes, and it has been suggested that it evolved in parallel with the adaptive immune system. The regulatory p101 and catalytic p110γ subunits comprise the class IB PI3Ks and are encoded by a single gene each. The p85 subunits contain SH2 and SH3 domains (Online Mendelian Inheritance in Man (OMIM) 171833). The SH2 domains bind preferentially to phosphorylated tyrosine residues in the amino acid sequence context Y-X-X-M.
Class II and III PI3K are differentiated from the Class I by their structure and function. The distinct feature of Class II PI3Ks is the C-terminal C2 domain. This domain lacks critical Asp residues to coordinate binding of Ca2+, which suggests class II PI3Ks bind lipids in a Ca2+-independent manner. Class II comprises three catalytic isoforms (C2α, C2β, and C2γ), but, unlike Classes I and III, no regulatory proteins. Class II catalyse the production of PI(3)P from PI and PI(3,4)P2 from PIP; however, little is known about their role in immune cells. PI(3,4)P2 has, however, been shown to play a role in the invagination phase of clathrin-mediated endocytosis. C2α and C2β are expressed through the body, but expression of C2γ is limited to hepatocytes. Class III produces only PI(3)P from PI  but are more similar to Class I in structure, as they exist as heterodimers of a catalytic (Vps34) and a regulatory (Vps15/p150) subunits. Class III seems to be primarily involved in the trafficking of proteins and vesicles. There is, however, evidence to show that they are able to contribute to the effectiveness of several process important to immune cells, not least phagocytosis. A group of more distantly related enzymes are sometimes referred to as class IV PI 3-kinases. 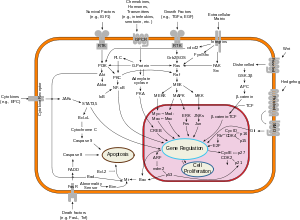 It is composed of ataxia telangiectasia mutated (ATM), ataxia telangiectasia and Rad3 related (ATR), DNA-dependent protein kinase (DNA-PK) and mammalian target of rapamycin (mTOR). They are protein serine/threonine kinases. The various 3-phosphorylated phosphoinositides that are produced by PI 3-kinases (PtdIns3P, PtdIns(3,4)P2, PtdIns(3,5)P2, and PtdIns(3,4,5)P3) function in a mechanism by which an assorted group of signalling proteins, containing PX domain, pleckstrin homology domains (PH domains), FYVE domains and other phosphoinositide-binding domains, are recruited to various cellular membranes. PI 3-kinases have been linked to an extraordinarily diverse group of cellular functions, including cell growth, proliferation, differentiation, motility, survival and intracellular trafficking. Many of these functions relate to the ability of class I PI 3-kinases to activate protein kinase B (PKB, aka Akt) as in the PI3K/AKT/mTOR pathway. The p110δ and p110γ isoforms regulate different aspects of immune responses. PI 3-kinases are also a key component of the insulin signaling pathway. Hence there is great interest in the role of PI 3-kinase signaling in diabetes mellitus. The pleckstrin homology domain of AKT binds directly to PtdIns(3,4,5)P3 and PtdIns(3,4)P2, which are produced by activated PI 3-kinase. Since PtdIns(3,4,5)P3 and PtdIns(3,4)P2 are restricted to the plasma membrane, these results in translocation of AKT to the plasma membrane. Likewise, the phosphoinositide-dependent kinase-1 (PDK1 or, rarely referred to as PDPK1) also contains a pleckstrin homology domain that binds directly to PtdIns(3,4,5)P3 and PtdIns(3,4)P2, causing it to also translocate to the plasma membrane upon activation of PI 3-kinase. The interaction of activated PDK1 and AKT allows AKT to become phosphorylated by PDK1 on threonine 308, leading to partial activation of AKT. Full activation of AKT occurs upon phosphorylation of serine 473 by the TORC2 complex of the mTOR protein kinase. The "PI3-k/AKT" signaling pathway has been shown to be required for an extremely diverse array of cellular activities - most notably cellular proliferation and survival. The phosphatidylinositol 3-kinase/protein kinase B pathway is stimulated in protection of astrocytes from ceramide-induced apoptosis. Many other proteins have been identified that are regulated by PtdIns(3,4,5)P3, including Bruton's tyrosine kinase (BTK), General Receptor for Phosphoinositides-1 (GRP1), and the O-linked N-acetylglucosamine (O-GlcNAc) transferase. The class IA PI 3-kinase p110α is mutated in many cancers. Many of these mutations cause the kinase to be more active. It is the single most mutated kinase in glioblastoma, the most malignant primary brain tumor. The PtdIns(3,4,5)P3 phosphatase PTEN that antagonises PI 3-kinase signaling is absent from many tumours. In addition, the epidermal growth factor receptor EGFR that functions upstream of PI 3-kinase is mutationally activated or overexpressed in cancer. Hence, PI 3-kinase activity contributes significantly to cellular transformation and the development of cancer. PI3K has also been implicated in long-term potentiation (LTP). Whether it is required for the expression or the induction of LTP is still debated. In mouse hippocampal CA1 neurons, PI3K is complexed with AMPA receptors and compartmentalized at the postsynaptic density of glutamatergic synapses. PI3K is phosphorylated upon NMDA receptor-dependent CaMKII activity, and it then facilitates the insertion of AMPA-R GluR1 subunits into the plasma membrane. This suggests that PI3K is required for the expression of LTP. Furthermore, PI3K inhibitors abolished the expression of LTP in rat hippocampal CA1, but do not affect its induction. Notably, the dependence of late-phase LTP expression on PI3K seems to decrease over time. However, another study found that PI3K inhibitors suppressed the induction, but not the expression, of LTP in mouse hippocampal CA1. The PI3K pathway also recruits many other proteins downstream, including mTOR, GSK3β, and PSD-95. The PI3K-mTOR pathway leads to the phosphorylation of p70S6K, a kinase that facilitates translational activity, further suggesting that PI3K is required for the protein-synthesis phase of LTP induction instead. PI3Ks interact with the insulin receptor substrate (IRS) to regulate glucose uptake through a series of phosphorylation events. Many of the PI 3-kinases appear to have a serine/threonine kinase activity in vitro; however, it is unclear whether this has any role in vivo. As wortmannin and LY294002 are broad inhibitors against PI 3-kinases and a number of unrelated proteins at higher concentrations they are too toxic to be used as therapeutics. A number of pharmaceutical companies have recently been working on PI 3-kinase isoform specific inhibitors including the class I PI 3-kinase, p110δ isoform specific inhibitors, IC486068 and IC87114, ICOS Corporation.. GDC-0941 is a highly selective inhibitor of p110α with little activity against mTOR. ^ PDB: 2chz​; Knight ZA, Gonzalez B, Feldman ME, Zunder ER, Goldenberg DD, Williams O, Loewith R, Stokoe D, Balla A, Toth B, Balla T, Weiss WA, Williams RL, Shokat KM (2006). "A pharmacological map of the PI3-K family defines a role for p110alpha in insulin signaling". Cell. 125 (4): 733–47. doi:10.1016/j.cell.2006.03.035. PMC 2946820  . PMID 16647110. ^ Giese N (2009). "Cell pathway on overdrive prevents cancer response to dietary restriction". PhysOrg.com. Retrieved 2009-04-22. ^ Kalaany NY, Sabatini DM (April 2009). "Tumours with PI3K activation are resistant to dietary restriction". Nature. 458 (7239): 725–31. doi:10.1038/nature07782. PMC 2692085  . PMID 19279572. ^ Whitman M, Kaplan DR, Schaffhausen B, Cantley L, Roberts TM (1985). "Association of phosphatidylinositol kinase activity with polyoma middle-T competent for transformation". Nature. 315 (6016): 239–42. doi:10.1038/315239a0. PMID 2987699. ^ Whitman M, Downes CP, Keeler M, Keller T, Cantley L (April 1988). "Type I phosphatidylinositol kinase makes a novel inositol phospholipid, phosphatidylinositol-3-phosphate". Nature. 332 (6165): 644–6. doi:10.1038/332644a0. PMID 2833705. ^ Auger KR, Serunian LA, Soltoff SP, Libby P, Cantley LC (April 1989). "PDGF-dependent tyrosine phosphorylation stimulates production of novel polyphosphoinositides in intact cells". Cell. 57 (1): 167–75. doi:10.1016/0092-8674(89)90182-7. PMID 2467744. ^ Traynor-Kaplan AE, Harris AL, Thompson BL, Taylor P, Sklar LA (July 1988). "An inositol tetrakisphosphate-containing phospholipid in activated neutrophils". Nature. 334 (6180): 353–6. doi:10.1038/334353a0. PMID 3393226. ^ a b c Leevers SJ, Vanhaesebroeck B, Waterfield MD (April 1999). "Signalling through phosphoinositide 3-kinases: the lipids take centre stage". Current Opinion in Cell Biology. 11 (2): 219–25. doi:10.1016/S0955-0674(99)80029-5. PMID 10209156. ^ Okkenhaug K (January 2013). "Signaling by the phosphoinositide 3-kinase family in immune cells". Annual Review of Immunology. 31 (2): 675–704. doi:10.1146/annurev-immunol-032712-095946. PMC 4516760  . PMID 23330955. ^ Carpenter CL, Duckworth BC, Auger KR, Cohen B, Schaffhausen BS, Cantley LC (November 1990). "Purification and characterization of phosphoinositide 3-kinase from rat liver". The Journal of Biological Chemistry. 265 (32): 19704–11. PMID 2174051. ^ Songyang Z, Shoelson SE, Chaudhuri M, Gish G, Pawson T, Haser WG, King F, Roberts T, Ratnofsky S, Lechleider RJ (March 1993). "SH2 domains recognize specific phosphopeptide sequences". Cell. 72 (5): 767–78. doi:10.1016/0092-8674(93)90404-E. PMID 7680959. ^ Yoakim M, Hou W, Songyang Z, Liu Y, Cantley L, Schaffhausen B (September 1994). "Genetic analysis of a phosphatidylinositol 3-kinase SH2 domain reveals determinants of specificity". Molecular and Cellular Biology. 14 (9): 5929–38. doi:10.1128/MCB.14.9.5929. PMC 359119  . PMID 8065326. ^ Cite error: The named reference pmid25264171 was invoked but never defined (see the help page). ^ Franke TF, Kaplan DR, Cantley LC, Toker A (January 1997). "Direct regulation of the Akt proto-oncogene product by phosphatidylinositol-3,4-bisphosphate". Science. 275 (5300): 665–8. doi:10.1126/science.275.5300.665. PMID 9005852. ^ Gómez Del Pulgar T, De Ceballos ML, Guzmán M, Velasco G (September 2002). "Cannabinoids protect astrocytes from ceramide-induced apoptosis through the phosphatidylinositol 3-kinase/protein kinase B pathway". The Journal of Biological Chemistry. 277 (39): 36527–33. doi:10.1074/jbc.M205797200. PMID 12133838. ^ a b Bleeker FE, Lamba S, Zanon C, Molenaar RJ, Hulsebos TJ, Troost D, van Tilborg AA, Vandertop WP, Leenstra S, van Noorden CJ, Bardelli A (September 2014). "Mutational profiling of kinases in glioblastoma". BMC Cancer. 14: 718. doi:10.1186/1471-2407-14-718. PMID 25256166. ^ Bleeker FE, Molenaar RJ, Leenstra S (May 2012). "Recent advances in the molecular understanding of glioblastoma". Journal of Neuro-Oncology. 108 (1): 11–27. doi:10.1007/s11060-011-0793-0. PMC 3337398  . PMID 22270850. ^ Man HY, Wang Q, Lu WY, Ju W, Ahmadian G, Liu L, D'Souza S, Wong TP, Taghibiglou C, Lu J, Becker LE, Pei L, Liu F, Wymann MP, MacDonald JF, Wang YT (May 2003). "Activation of PI3-kinase is required for AMPA receptor insertion during LTP of mEPSCs in cultured hippocampal neurons". Neuron. 38 (4): 611–24. doi:10.1016/S0896-6273(03)00228-9. PMID 12765612. ^ Joyal JL, Burks DJ, Pons S, Matter WF, Vlahos CJ, White MF, Sacks DB (November 1997). "Calmodulin activates phosphatidylinositol 3-kinase". The Journal of Biological Chemistry. 272 (45): 28183–6. doi:10.1074/jbc.272.45.28183. PMID 9353264. ^ Sanna PP, Cammalleri M, Berton F, Simpson C, Lutjens R, Bloom FE, Francesconi W (May 2002). "Phosphatidylinositol 3-kinase is required for the expression but not for the induction or the maintenance of long-term potentiation in the hippocampal CA1 region". The Journal of Neuroscience. 22 (9): 3359–65. PMID 11978812. ^ Karpova A, Sanna PP, Behnisch T (February 2006). "Involvement of multiple phosphatidylinositol 3-kinase-dependent pathways in the persistence of late-phase long term potentiation expression". Neuroscience. 137 (3): 833–41. doi:10.1016/j.neuroscience.2005.10.012. PMID 16326012. ^ Opazo P, Watabe AM, Grant SG, O'Dell TJ (May 2003). "Phosphatidylinositol 3-kinase regulates the induction of long-term potentiation through extracellular signal-related kinase-independent mechanisms". The Journal of Neuroscience. 23 (9): 3679–88. PMID 12736339. ^ a b Yang PC, Yang CH, Huang CC, Hsu KS (February 2008). "Phosphatidylinositol 3-kinase activation is required for stress protocol-induced modification of hippocampal synaptic plasticity". The Journal of Biological Chemistry. 283 (5): 2631–43. doi:10.1074/jbc.M706954200. PMID 18057005. ^ Peineau S, Taghibiglou C, Bradley C, Wong TP, Liu L, Lu J, Lo E, Wu D, Saule E, Bouschet T, Matthews P, Isaac JT, Bortolotto ZA, Wang YT, Collingridge GL (March 2007). "LTP inhibits LTD in the hippocampus via regulation of GSK3beta". Neuron. 53 (5): 703–17. doi:10.1016/j.neuron.2007.01.029. PMID 17329210. ^ Toker A, Cantley LC (June 1997). "Signalling through the lipid products of phosphoinositide-3-OH kinase". Nature. 387 (6634): 673–6. doi:10.1038/42648. PMID 9192891. ^ Cammalleri M, Lütjens R, Berton F, King AR, Simpson C, Francesconi W, Sanna PP (November 2003). "Time-restricted role for dendritic activation of the mTOR-p70S6K pathway in the induction of late-phase long-term potentiation in the CA1". Proceedings of the National Academy of Sciences of the United States of America. 100 (24): 14368–73. doi:10.1073/pnas.2336098100. PMC 283598  . PMID 14623952. ^ Kumar DT, Doss CG (2016-01-01). "Investigating the Inhibitory Effect of Wortmannin in the Hotspot Mutation at Codon 1047 of PIK3CA Kinase Domain: A Molecular Docking and Molecular Dynamics Approach". Advances in Protein Chemistry and Structural Biology. 102: 267–97. doi:10.1016/bs.apcsb.2015.09.008. PMID 26827608. ^ Sudhakar N, Priya Doss CG, Thirumal Kumar D, Chakraborty C, Anand K, Suresh M (2016-01-02). "Deciphering the impact of somatic mutations in exon 20 and exon 9 of PIK3CA gene in breast tumors among Indian women through molecular dynamics approach". Journal of Biomolecular Structure & Dynamics. 34 (1): 29–41. doi:10.1080/07391102.2015.1007483. PMID 25679319. Schild C, Wirth M, Reichert M, Schmid RM, Saur D, Schneider G (December 2009). "PI3K signaling maintains c-myc expression to regulate transcription of E2F1 in pancreatic cancer cells". Molecular Carcinogenesis. 48 (12): 1149–58. doi:10.1002/mc.20569. PMID 19603422. Williams R, Berndt A, Miller S, Hon WC, Zhang X (August 2009). "Form and flexibility in phosphoinositide 3-kinases". Biochemical Society Transactions. 37 (Pt 4): 615–26. doi:10.1042/BST0370615. PMID 19614567. Quaresma AJ, Sievert R, Nickerson JA (April 2013). "Regulation of mRNA export by the PI3 kinase/AKT signal transduction pathway". Molecular Biology of the Cell. 24 (8): 1208–21. doi:10.1091/mbc.E12-06-0450. PMC 3623641  . PMID 23427269. Some members of this family probably do not have lipid kinase activity and are protein kinases, e.g. P42345 . Phosphatidylinositol 3-kinase (PI3-kinase) (EC) [PUBMED:1322797] is an enzyme that phosphorylates phosphoinositides on the 3-hydroxyl group of the inositol ring. The three products of PI3-kinase - PI-3-P, PI-3,4-P(2) and PI-3,4,5-P(3) function as secondary messengers in cell signalling. Phosphatidylinositol 4-kinase (PI4-kinase) (EC) [PUBMED:8194527] is an enzyme that acts on phosphatidylinositol (PI) in the first committed step in the production of the secondary messenger inositol-1'4'5'-trisphosphate. This domain is also present in a wide range of protein kinases, involved in diverse cellular functions, such as control of cell growth, regulation of cell cycle progression, a DNA damage checkpoint, recombination, and maintenance of telomere length. Despite significant homology to lipid kinases, no lipid kinase activity has been demonstrated for any of the PIK-related kinases [PUBMED:12456783]. The PI3- and PI4-kinases share a well conserved domain at their C-terminal section; this domain seems to be distantly related to the catalytic domain of protein kinases [PUBMED:8387896, PUBMED:12151228]. The catalytic domain of PI3K has the typical bilobal structure that is seen in other ATP-dependent kinases, with a small N-terminal lobe and a large C-terminal lobe. The core of this domain is the most conserved region of the PI3Ks. The ATP cofactor binds in the crevice formed by the N-and C-terminal lobes, a loop between two strands provides a hydrophobic pocket for binding of the adenine moiety, and a lysine residue interacts with the alpha-phosphate. In contrast to protein kinases, the PI3K loop which interacts with the phosphates of the ATP and is known as the glycine-rich or P-loop, contains no glycine residues. Instead, contact with the ATP -phosphate is maintained through the side chain of a conserved serine residue. For those sequences which have a structure in the Protein DataBank, we use the mapping between UniProt, PDB and Pfam coordinate systems from the PDBe group, to allow us to map Pfam domains onto UniProt sequences and three-dimensional protein structures. The table below shows the structures on which the PI3_PI4_kinase domain has been found. There are 329 instances of this domain found in the PDB. Note that there may be multiple copies of the domain in a single PDB structure, since many structures contain multiple copies of the same protein sequence.